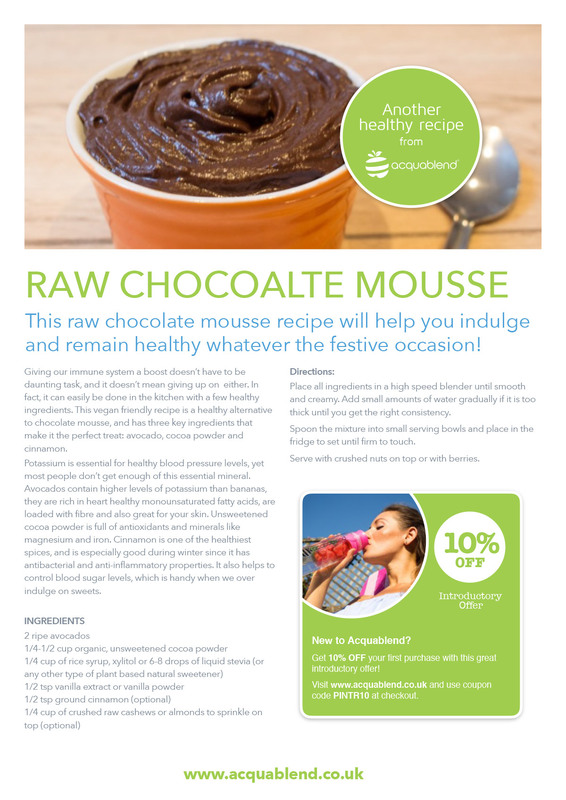 At this time of the year with festive treats all around us probably the last thing on our mind is to stay healthy, so this raw chocolate mousse recipe will help you indulge and remain healthy. On the other hand, it is also the time when viruses such as the flu are most easily transmitted. Fortunately giving our immune system a boost doesn’t have to be daunting task, and it doesn’t mean giving up on some favourites like chocolate mousse either. In fact, it can easily be done in the kitchen with a few healthy ingredients. This vegan friendly recipe is a healthy alternative to chocolate mousse, and has three key ingredients that make it the perfect treat: avocado, cocoa powder and cinnamon. Potassium is essential for healthy blood pressure levels, yet most people don’t get enough of this essential mineral. Avocados contain higher levels of potassium than bananas, they are rich in heart healthy monounsaturated fatty acids, are loaded with fibre and also great for your skin. Unsweetened cocoa powder is full of antioxidants and minerals like magnesium and iron. Cinnamon is one of the healthiest spices, and is especially good during winter since it has antibacterial and anti-inflammatory properties. It also helps to control blood sugar levels, which is handy when we over indulge on sweets. Place all ingredients in a high speed blender until smooth and creamy. Add small amounts of water gradually if it is too thick until you get the right consistency. Spoon the mixture into small serving bowls and place in the fridge to set until firm to touch. Serve with crushed nuts on top or with berries.